Internet Evidence Finder searches the selected drive, folder (and sub-folders, optionally), or file (memory dumps, pagefile.sys, hiberfil.sys, etc) for Internet artifacts. It can currently find Facebook live chat messages and page fragments, MSN/Windows Live Messenger chat, Yahoo! chat, Yahoo! Webmail chat, GoogleTalk chat, Gmail email, Limewire ver 5.3.6 Search History, Limewire.props files, IE8 InPrivate/Recovery URLs, Yahoo! Messenger Group Chat, Yahoo! Webmail email, Hotmail Webmail email, AOL Instant Messenger chat logs, Messenger Plus! chat logs, MySpace chat, Bebo chat, and non-encrypted Yahoo! Messenger chat. Depending on the items selected, IEF creates a report containing the search results or creates individual files containing the data found. Without a purchased registration key, IEF will run in “demo mode” with only up to 10 items per selected search being saved to file(s). 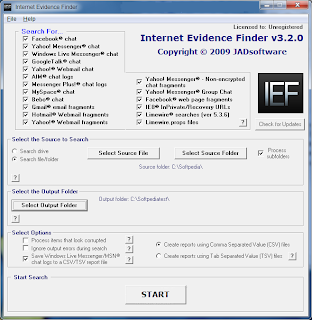 A demo version of Internet Evidence Finder can be downloaded from JADsoftware.com but only up to 10 items per selected search being saved to file(s) in “demo mode”. Internet Evidence Finder is commercial software and a license needs to be purchased to “unlock” the demo version of Fchat for full functionality.